The Model 192 uses special glass that can withstand long-term exposure to radiation up to a dose of 100 million radians and temperatures to 55°C without discoloration. 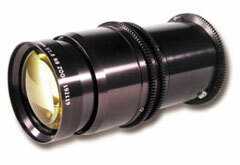 Operating at f / 1.8, it provides high image resolution and minimum geometric distortion from 400 to 750nm, and it can image objects from 800 mm to infinity without using add-on adapters. When focused at infinity, the lens achieves high image resolution onaxis at full aperture throughout the zoom range without refocusing. It is designed for use with 1/2- and 2/3-inch CCTV cameras and with Newvicon and Chalnicon tubes.